I put this recipe together for Valentine's Day but anytime and any occasion would be perfect. Bring it to your next party or make it for movie night! In bowl add cereal, M & M, nuts. Melt the caramel in a separate bowl for 20 seconds at a time in the microwave. When melted add to the cereal and mix well. When mix is still sticky make little mounts the size of golf bowls using your hands or 2 spoons. Place on parchment paper. In separate bowl melt semi sweet chocolate every 10 seconds at a time. When melted sprinkle with a fork on the top of the mix mounts. let set and place in cupcake liners. I'm going to make these for Super Bowl Sunday! Thanks, Isabelle! i know that this has to be gooooood! 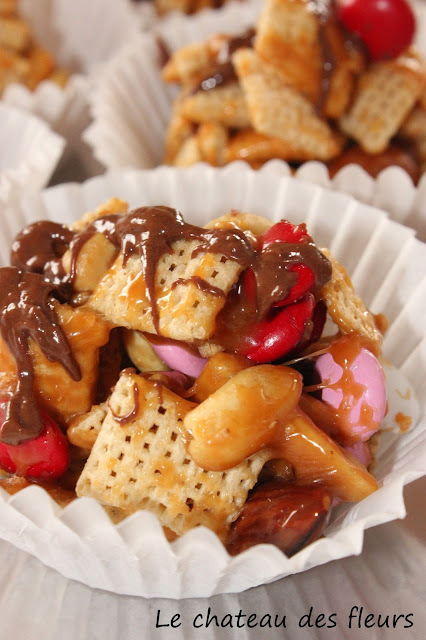 I don't usually care for chex mix on its own but adding chocolate would be a great idea! The kids asked me to make more!!! I love the crunchiness of the chex. This is so much better than the original recipe! People at the office will love this - thanks! These look like the perfect sweet/salty snack! Great for the game tomorrow! Wow, this look good and simple to make. Must try! I'll try this recipe!Looks yummy! wow that looks amazing! :) thanks for sharing!